00:20:00 4 servings, 2 tacos (114 g) each. 4 servings, 2 tacos (114 g) each. Just 1 lb./450 g of fish goes a long way when used to make these flavourful tacos. Brush fish with 1 Tbsp. lime juice; sprinkle with seasoning mix. Cook in skillet sprayed with cooking spray on medium heat 3 to 3-1/2 min. on each side or until fish flakes easily with fork, drizzling with 1 Tbsp. of the remaining lime juice for the last minute. Remove from skillet; break into bite-size pieces with fork. Mix dressing, remaining lime juice and 1 Tbsp. cilantro. Add to coleslaw blend; mix lightly. 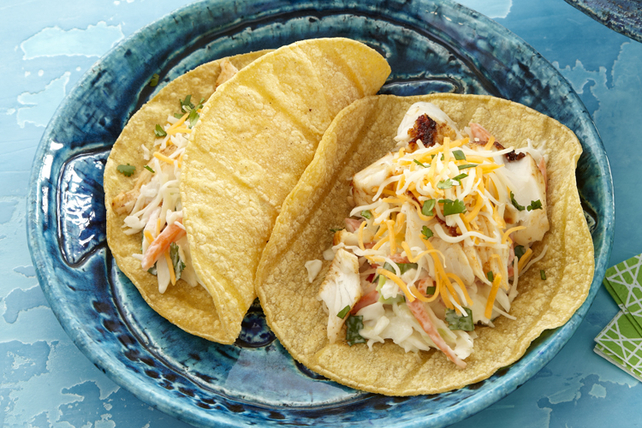 Top tortillas with coleslaw, fish, cheese and remaining cilantro. Prepare using small flour tortillas. Serving Size 4 servings, 2 tacos (114 g) each.